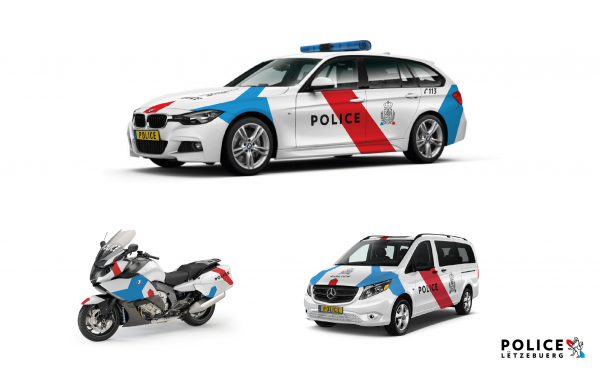 Due to its internal and external repositioning, the Luxembourg Police Grand-Ducale launched a European call for tender in March 2017 for the development of its new visual identity, including a new name proposal. 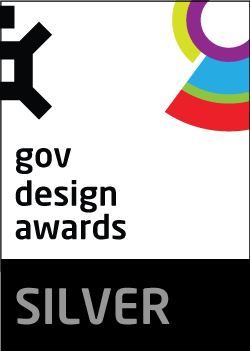 Our studio, Quattro Creative, had the chance to win this huge competition. The new logo had to take into account the new vision of the Police representing the formal enforcement body with the desire to express a mission and vision through a revised visual entity. 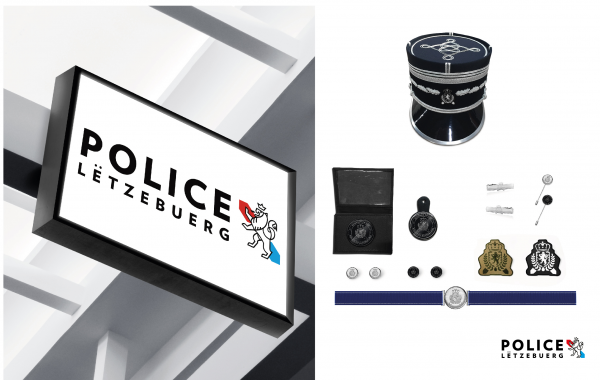 The logo needed to convey the fact that the "new" Police is even much closer to the service of citizens, always available, preventing crime and civil disorder and is reactive to all new social events. Indeed, on the one hand the new vision, and on the other hand the reform of the Police would considerably change its internal and external organization. This change implied also a rupture with the old visual identity. CONFIDENCE, INSPIRATION, SHARING AND AVAILABILITY. Confidence, proximity and collaboration with the citizen lead to a better PREVENTION. Accessibility and inspiration are a good mixture to take good INITIATIVES together. 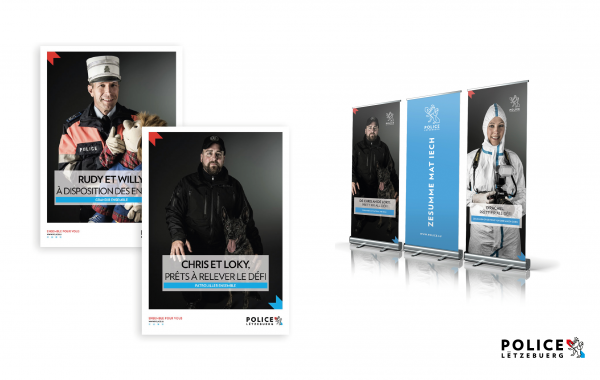 Another important criteria was to integrate some elements from the recent "Nation Branding" of Luxembourg (www.inspiringluxembourg.public.lu). The close collaboration with the Police and alignment on messaging has allowed for a successful output. The Police's logo consists of a crawling, crowned lion with a forked tail whose two ramifications cross. The "new" logo icon represents a minimalist interpretation of it. The arrows with the colours blue and red reflect the geometric shapes of the recent "Nation Branding" of Luxembourg and replace the 2 swords of the old logo. For visibility and contrast reasons, the lion colour is black. The whitespace inside completes the colours of the flag of Luxembourg. 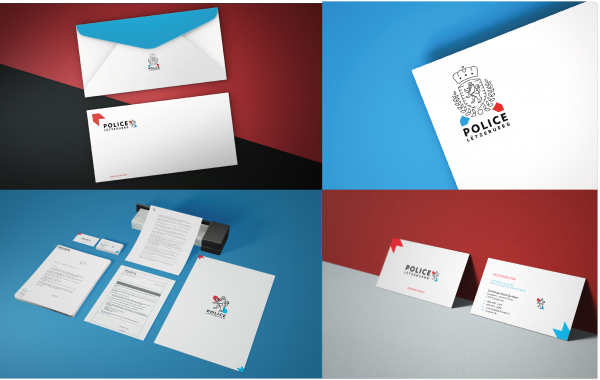 The same minimal result was achieved by redesigning the official Police emblem. It was mandatory to keep the shape of the old emblem velcro's, so that all the uniforms could be reused. 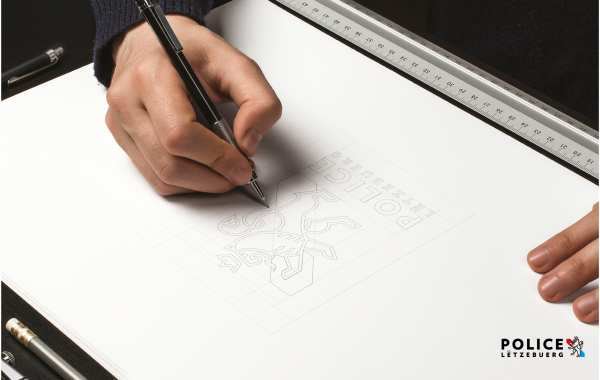 Indeed it was quite challenging to redesign this part of the identity. 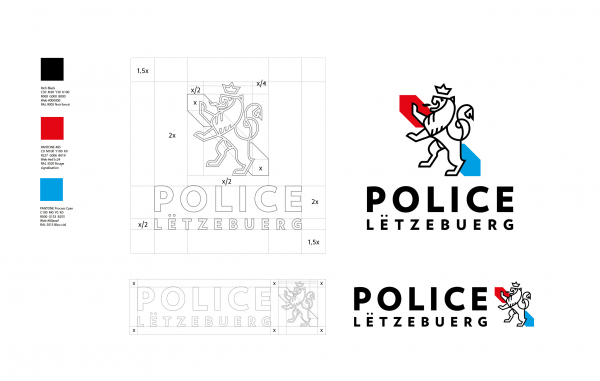 The new name "Police Lëtzebuerg" was changed into Luxembourgish to show the anchoring of the Police within the company and the country. During its use in the logotype and the emblem, the name will always be represented in black (symbol of balance and neutrality). 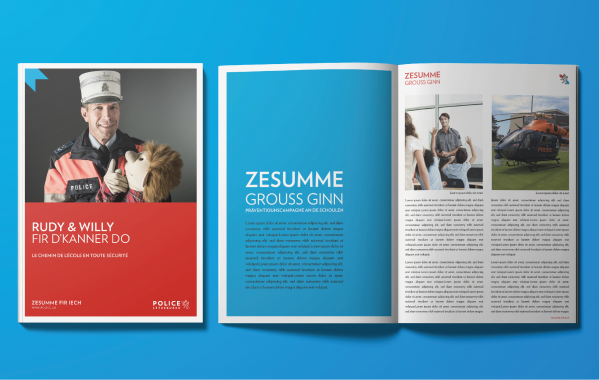 The slogan "Zesumme fir Iech" (Together For You) has been added to enhance the proximity with the citizens. This is a key element for all interactions through the media that will be used. Was it materials, was it understanding the market's needs, was it timing and communication, or something else? At the end of June 2017, we received the news that we were the winners of the pitch, it was also the day we made the kick-off meeting. At that moment, we were informed that we had only 3 months to develop the whole project as at the end of October 2017 a press conference was scheduled to present the new corporate identity to the public. We were only three team members, but with an excellent team work, we managed to deliver the project within the agreed deadline and were really proud of it. 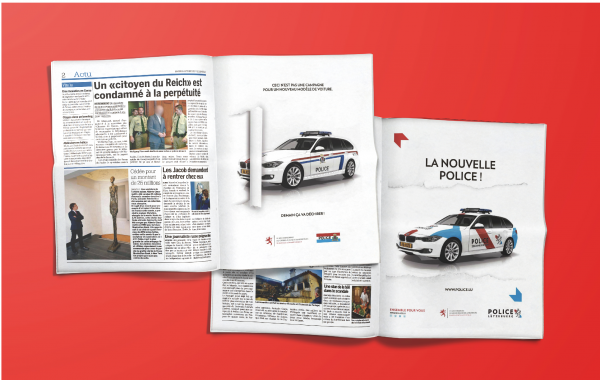 One of the main challenges was that the new identity had to be effective on all the different supports within the same deadline, from print to digital applications, on the many different police car models, on the tissues of the different uniforms, as well as on the metallic objects of the policemen and on the signs of the police stations, organise a media plan and the press conference with a brand new flexible stand and a video presentation. We are proud to say that we did it! A short time before the conference a teaser campaign was launched, which revealed a little part of the new logo and police car. 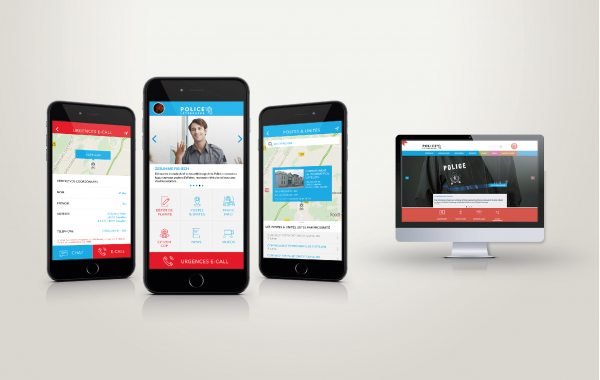 After the event, a huge launching campaign was developed for the public and the new elements have been shared with the public. 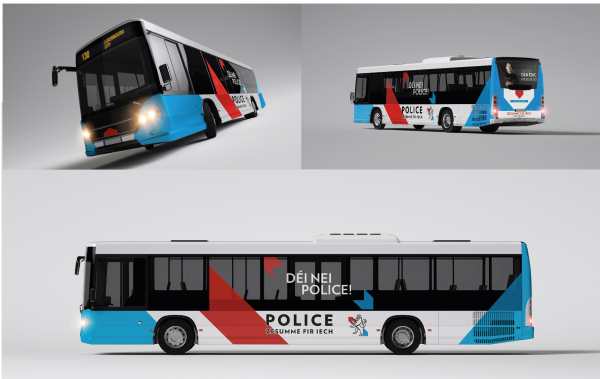 City busses were dressed up like the new police cars, the main cinema catwalk showed the elements of the new identity and to link even more the presence and the proximity of the policemen, a campaign with real police officers was displayed on several bus shelters with the use of the new slogan "Together For You". The new design is now more visible to be more recognisable.